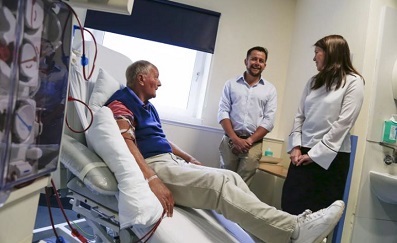 Research has found that giving patients physiotherapy 20 years – and even more – after their stroke can bring life-changing improvements in hand, arm, shoulder, elbow and finger movements. These findings overturn the current medical consensus that 3-6 months is the limit for reaching a stroke patient’s full potential for carrying out tasks of everyday life, such as tying shoe laces or doing up buttons. This means that stroke survivors currently receive little to no physiotherapy after the first few months on the NHS. Researchers have also found that patients are able to tolerate, and benefit from, much greater doses of therapy that they currently have access to. The study involved 238 stroke survivors between three months and 20 years after their stroke. It found that, in some cases, the therapy made the difference between being able to carry out everyday tasks such as tying back their hair or dressing themselves. This can make the difference between being able to live independently or being dependent on others for at least one aspect of their daily care. Read the full story on inews.co.uk.